Fight the battle against stress. Now you have a new ally in the battle against stress: Pinadol. Pinadol is a once-daily tablet designed to give your body the nutrients it needs to take the edge off. And the ingredients in Pinadol help combat the negative effects stress can have on your system. ATTENTION: PINADOL BY BERKELEY PREMIUM NUTRACEUTICALS HAS BEEN RENAMED TO SUNEXIA SAME POWERFUL INGREDIENTS, JUST A DIFFERENT NAME. Stress is our reaction to any change that requires us to adjust or respond. Everyone experiences stress at one time or another.In fact, the human body is designed to experience stress and react to it. In fact, stress is what kept our caveman ancestors alive, keeping them alert and ready to avoid danger. Even today, stress can be positive in that regard. A little bit of stress keeps us on our toes and improves our reaction time by getting adrenalin flowing. Stress becomes negative when we face continuous challenges without relief or relaxation between challenges. As a result, we become overworked, and stress-related tension builds. When stress persists, problems can occur. That's because stress can sap your body of the nutrients and energy it needs to perform at peak levels. When this happens, some people become irritable; others feel depressed and unable to cope. In fact, physical stress can even make us more susceptible to colds, flu, and other illnesses. It may be impossible to avoid or change events that cause us stress. 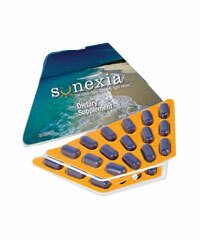 But now you can refuel your body with the nutrients that stress takes away, with Pinadol. Combined with proper diet and exercise, Pinadol can help your body battle stress. Taking just one Pinadol tablet each day provides your body with a proprietary blend of nutrients designed to help balance your body's reaction and keep you calm. Order Pinadol Now.